A commodity market is a market that trades in the primary economic sector rather than manufactured products, such as cocoa, fruit and sugar. Hard commodities are mined, such as gold and oil. Investors access about 50 major commodity markets worldwide with purely financial transactions increasingly outnumbering physical trades in which goods are delivered. Futures contracts are the oldest way of investing in commodities. Futures are secured by physical assets. Commodity markets can include physical trading and derivatives trading using spot prices, forwards, futures, and options on futures. Farmers have used a simple form of derivative trading in the commodity market for centuries for price risk management. Derivatives such as futures contracts, Swaps (1970s-), Exchange-traded Commodities (ETC) (2003-), forward contracts have become the primary trading instruments in commodity markets. Futures are traded on regulated commodities exchanges. Over-the-counter (OTC) contracts are "privately negotiated bilateral contracts entered into between the contracting parties directly". Commodity-based money and commodity markets in a crude early form are believed to have originated in Sumer between 4500 BC and 4000 BC. Sumerians first used clay tokens sealed in a clay vessel, then clay writing tablets to represent the amount—for example, the number of goats, to be delivered. These promises of time and date of delivery resemble futures contract. Early civilizations variously used pigs, rare seashells, or other items as commodity money. Since that time traders have sought ways to simplify and standardize trade contracts. Gold and silver markets evolved in classical civilizations. At first the precious metals were valued for their beauty and intrinsic worth and were associated with royalty. In time, they were used for trading and were exchanged for other goods and commodities, or for payments of labor. Gold, measured out, then became money. Gold's scarcity, its unique density and the way it could be easily melted, shaped, and measured made it a natural trading asset. Beginning in the late 10th century, commodity markets grew as a mechanism for allocating goods, labor, land and capital across Europe. Between the late 11th and the late 13th century, English urbanization, regional specialization, expanded and improved infrastructure, the increased use of coinage and the proliferation of markets and fairs were evidence of commercialization. The spread of markets is illustrated by the 1466 installation of reliable scales in the villages of Sloten and Osdorp so villagers no longer had to travel to Haarlem or Amsterdam to weigh their locally produced cheese and butter. The Amsterdam Stock Exchange, often cited as the first stock exchange, originated as a market for the exchange of commodities. Early trading on the Amsterdam Stock Exchange often involved the use of very sophisticated contracts, including short sales, forward contracts, and options. "Trading took place at the Amsterdam Bourse, an open aired venue, which was created as a commodity exchange in 1530 and rebuilt in 1608. Commodity exchanges themselves were a relatively recent invention, existing in only a handful of cities." In 1864, in the United States, wheat, corn, cattle, and pigs were widely traded using standard instruments on the Chicago Board of Trade (CBOT), the world's oldest futures and options exchange. Other food commodities were added to the Commodity Exchange Act and traded through CBOT in the 1930s and 1940s, expanding the list from grains to include rice, mill feeds, butter, eggs, Irish potatoes and soybeans. Successful commodity markets require broad consensus on product variations to make each commodity acceptable for trading, such as the purity of gold in bullion. Classical civilizations built complex global markets trading gold or silver for spices, cloth, wood and weapons, most of which had standards of quality and timeliness. Through the 19th century "the exchanges became effective spokesmen for, and innovators of, improvements in transportation, warehousing, and financing, which paved the way to expanded interstate and international trade." Reputation and clearing became central concerns, and states that could handle them most effectively developed powerful financial centers. In 1934, the US Bureau of Labor Statistics began the computation of a daily Commodity price index that became available to the public in 1940. By 1952, the Bureau of Labor Statistics issued a Spot Market Price Index that measured the price movements of "22 sensitive basic commodities whose markets are presumed to be among the first to be influenced by changes in economic conditions. As such, it serves as one early indication of impending changes in business activity." A commodity index fund is a fund whose assets are invested in financial instruments based on or linked to a commodity index. In just about every case the index is in fact a Commodity Futures Index. The first such index was the Commodity Research Bureau (CRB) Index, which began in 1958. Its construction made it unuseful as an investment index. The first practically investable commodity futures index was the Goldman Sachs Commodity Index, created in 1991, and known as the "GSCI". The next was the Dow Jones AIG Commodity Index. It differed from the GSCI primarily in the weights allocated to each commodity. The DJ AIG had mechanisms to periodically limit the weight of any one commodity and to remove commodities whose weights became too small. After AIG's financial problems in 2008 the Index rights were sold to UBS and it is now known as the DJUBS index. Other commodity indices include the Reuters / CRB index (which is the old CRB Index as re-structured in 2005) and the Rogers Index. Cash commodities or "actuals" refer to the physical goods—e.g., wheat, corn, soybeans, crude oil, gold, silver—that someone is buying/selling/trading as distinguished from derivatives. In a call option counterparties enter into a financial contract option where the buyer purchases the right but not the obligation to buy an agreed quantity of a particular commodity or financial instrument (the underlying) from the seller of the option at a certain time (the expiration date) for a certain price (the strike price). The seller (or "writer") is obligated to sell the commodity or financial instrument should the buyer so decide. The buyer pays a fee (called a premium) for this right. 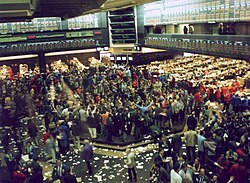 In traditional stock market exchanges such as the New York Stock Exchange (NYSE), most trading activity took place in the trading pits in face-to-face interactions between brokers and dealers in open outcry trading. In 1992 the Financial Information eXchange (FIX) protocol was introduced, allowing international real-time exchange of information regarding market transactions. The U.S. Securities and Exchange Commission ordered U.S. stock markets to convert from the fractional system to a decimal system by April 2001. Metrification, conversion from the imperial system of measurement to the metrical, increased throughout the 20th century. Eventually FIX-compliant interfaces were adopted globally by commodity exchanges using the FIX Protocol. In 2001 the Chicago Board of Trade and the Chicago Mercantile Exchange (later merged into the CME group, the world's largest futures exchange company) launched their FIX-compliant interface. The robust growth of emerging market economies (EMEs, such as Brazil, Russia, India, and China), beginning in the 1990s, "propelled commodity markets into a supercycle". The size and diversity of commodity markets expanded internationally, and pension funds and sovereign wealth funds started allocating more capital to commodities, in order to diversify into an asset class with less exposure to currency depreciation. In 2012, as emerging-market economies slowed down, commodity prices peaked and started to decline. From 2005 through 2013, energy and metals' real prices remained well above their long-term averages. In 2012, real food prices were their highest since 1982. The price of gold bullion fell dramatically on 12 April 2013 and analysts frantically sought explanations. Rumors spread that the European Central Bank (ECB) would force Cyprus to sell its gold reserves in response to its financial crisis. Major banks such as Goldman Sachs began immediately to short gold bullion. Investors scrambled to liquidate their exchange-traded funds (ETFs)[notes 3] and margin call selling accelerated. George Gero, precious metals commodities expert at the Royal Bank of Canada (RBC) Wealth Management section reported that he had not seen selling of gold bullion as panicked as this in his forty years in commodity markets. The earliest commodity exchange-traded fund (ETFs), such as SPDR Gold Shares NYSE Arca: GLD and iShares Silver Trust NYSE Arca: SLV, actually owned the physical commodities. Similar to these are NYSE Arca: PALL (palladium) and NYSE Arca: PPLT (platinum). However, most Exchange Traded Commodities (ETCs) implement a futures trading strategy. At the time Russian Prime Minister Dmitry Medvedev warned that Russia could sink into recession. He argued that "We live in a dynamic, fast-developing world. It is so global and so complex that we sometimes cannot keep up with the changes". Analysts have claimed that Russia's economy is overly dependent on commodities. A Spot contract is an agreement where delivery and payment either takes place immediately, or with a short lag. Physical trading normally involves a visual inspection and is carried out in physical markets such as a farmers market. Derivatives markets, on the other hand, require the existence of agreed standards so that trades can be made without visual inspection. US soybean futures, for something else, are of not being standard grade if they are "GMO or a mixture of GMO and Non-GMO No. 2 yellow soybeans of Indiana, Ohio and Michigan origin produced in the U.S.A. (Non-screened, stored in silo)". They are of "deliverable grade" if they are "GMO or a mixture of GMO and Non-GMO No. 2 yellow soybeans of Iowa, Illinois and Wisconsin origin produced in the U.S.A. (Non-screened, stored in silo)". Note the distinction between states, and the need to clearly mention their status as GMO (genetically modified organism) which makes them unacceptable to most organic food buyers. Similar specifications apply for cotton, orange juice, cocoa, sugar, wheat, corn, barley, pork bellies, milk, feed, stuffs, fruits, vegetables, other grains, other beans, hay, other livestock, meats, poultry, eggs, or any other commodity which is so traded. Standardization has also occurred technologically, as the use of the FIX Protocol by commodities exchanges has allowed trade messages to be sent, received and processed in the same format as stocks or equities. This process began in 2001 when the Chicago Mercantile Exchange launched a FIX-compliant interface that was adopted by commodity exchanges around the world. Derivatives evolved from simple commodity future contracts into a diverse group of financial instruments that apply to every kind of asset, including mortgages, insurance and many more. Futures contracts, Swaps (1970s-), Exchange-traded Commodities (ETC) (2003-), forward contracts, etc. are examples. They can be traded through formal exchanges or through Over-the-counter (OTC). Commodity market derivatives unlike credit default derivatives for example, are secured by the physical assets or commodities. A forward contract is an agreement between two parties to exchange at a fixed future date a given quantity of a commodity for a specific price defined when the contract is finalized. The fixed price is also called forward price. Such forward contracts began as a way of reducing pricing risk in food and agricultural product markets. By agreeing in advance on a price for a future delivery, farmers were able protect their output agains't a possible fall of market prices and in contrast buyers were able to protect themselves against's a possible rise of market prices. Forward contracts for example, were used for rice in seventeenth century Japan. Futures contracts are standardized forward contracts that are transacted through an exchange. In futures contracts the buyer and the seller stipulate product, grade, quantity and location and leaving price as the only variable. Agricultural futures contracts are the oldest, in use in the United States for more than 170 years. Modern futures agreements, began in Chicago in the 1840s, with the appearance of the railroads. Chicago, centrally located, emerged as the hub between Midwestern farmers and east coast consumer population centers. A swap is a derivative in which counterparties exchange the cash flows of one party's financial instrument for those of the other party's financial instrument. They were introduced in the 1970s. Exchange-traded commodity is a term used for commodity exchange-traded funds (which are funds) or commodity exchange-traded notes (which are notes). These track the performance of an underlying commodity index including total return indices based on a single commodity. They are similar to ETFs and traded and settled exactly like stock funds. ETCs have market maker support with guaranteed liquidity, enabling investors to easily invest in commodities. They were introduced in 2003. At first only professional institutional investors had access, but online exchanges opened some ETC markets to almost anyone. ETCs were introduced partly in response to the tight supply of commodities in 2000, combined with record low inventories and increasing demand from emerging markets such as China and India. Prior to the introduction of ETCs, by the 1990s ETFs pioneered by Barclays Global Investors (BGI) revolutionized the mutual funds industry. By the end of December 2009 BGI assets hit an all-time high of $1 trillion. Gold was the first commodity to be securitised through an Exchange Traded Fund (ETF) in the early 1990s, but it was not available for trade until 2003. The idea of a Gold ETF was first officially conceptualised by Benchmark Asset Management Company Private Ltd in India, when they filed a proposal with the Securities and Exchange Board of India in May 2002. The first gold exchange-traded fund was Gold Bullion Securities launched on the ASX in 2003, and the first silver exchange-traded fund was iShares Silver Trust launched on the NYSE in 2006. As of November 2010 a commodity ETF, namely SPDR Gold Shares, was the second-largest ETF by market capitalization. Generally, commodity ETFs are index funds tracking non-security indices. Because they do not invest in securities, commodity ETFs are not regulated as investment companies under the Investment Company Act of 1940 in the United States, although their public offering is subject to SEC review and they need an SEC no-action letter under the Securities Exchange Act of 1934. They may, however, be subject to regulation by the Commodity Futures Trading Commission. The earliest commodity ETFs, such as SPDR Gold Shares NYSE Arca: GLD and iShares Silver Trust NYSE Arca: SLV, actually owned the physical commodity (e.g., gold and silver bars). Similar to these are NYSE Arca: PALL (palladium) and NYSE Arca: PPLT (platinum). However, most ETCs implement a futures trading strategy, which may produce quite different results from owning the commodity. Commodity ETFs trade provide exposure to an increasing range of commodities and commodity indices, including energy, metals, softs and agriculture. Many commodity funds, such as oil roll so-called front-month futures contracts from month to month. This provides exposure to the commodity, but subjects the investor to risks involved in different prices along the term structure, such as a high cost to roll. ETCs in China and India gained in importance due to those countries' emergence as commodities consumers and producers. China accounted for more than 60% of exchange-traded commodities in 2009, up from 40% the previous year. The global volume of ETCs increased by a 20% in 2010, and 50% since 2008, to around 2.5 billion million contracts. Over-the-counter (OTC) commodities derivatives trading originally involved two parties, without an exchange. Exchange trading offers greater transparency and regulatory protections. In an OTC trade, the price is not generally made public. OTC commodities derivatives are higher risk but may also lead to higher profits. Between 2007 and 2010, global physical exports of commodities fell by 2%, while the outstanding value of OTC commodities derivatives declined by two-thirds as investors reduced risk following a five-fold increase in the previous three years. Money under management more than doubled between 2008 and 2010 to nearly $380 billion. Inflows into the sector totaled over $60 billion in 2010, the second highest year on record, down from $72 billion the previous year. The bulk of funds went into precious metals and energy products. The growth in prices of many commodities in 2010 contributed to the increase in the value of commodities funds under management. A commodity contract for difference (CFD) is a derivative instrument that mirrors the price movements of the commodity underlying the contract. Commodity CFDs are transacted worldwide (apart from the US) through regulated brokers. CFD investors can speculate on the price of a commodity moving higher (going long the CFD) or lower (going short the CFD). CFD investors do not actually own the commodity. Instead, they enter into a contract with a broker to capture the difference between the price of the commodity at the time that they transact the CFD and the price at the time they choose to exit. CFDs typically require the investor to put up margin of about 3-5% of the price of the underlying commodity contract. For example; Imagine you’re bullish on oil. You decide to acquire CFDs to capitalize on this. You can acquire a long contract for $60.50. To buy 20 long CFDs on 3% margin, you would need $3,630 in your account ($60.50 [long price] x 20 [number of contracts] x 100 [number of barrels in a standard contract] x 0.03 [margin percent]). You would then “control” $121,000 worth of oil for your $3,630. That afternoon, you notice the price is up to $62.50 to $62.75, so you exit the trade, which now has a value of $125,500. Your profit would be approximately $4,500 on the deal. Of course, had the market moved against you, the leverage can have the opposite impact and losses can be significant. CFDs are complex products for experienced traders but speculation made also using CFDs is considered negative and to be avoided in the financial market. A commodities exchange is an exchange where various commodities and derivatives are traded. Most commodity markets across the world trade in agricultural products and other raw materials (like wheat, barley, sugar, maize, cotton, cocoa, coffee, milk products, pork bellies, oil, metals, etc.) and contracts based on them. These contracts can include spot prices, forwards, futures and options on futures. Other sophisticated products may include interest rates, environmental instruments, swaps, or freight contracts. Energy commodities include crude oil particularly West Texas Intermediate (WTI) crude oil and Brent crude oil, natural gas, heating oil, ethanol and purified terephthalic acid. Hedging is a common practice for these commodities. For many years, West Texas Intermediate (WTI) crude oil, a light, sweet crude oil, was the world’s most-traded commodity. WTI is a grade used as a benchmark in oil pricing. It is the underlying commodity of Chicago Mercantile Exchange's oil futures contracts. WTI is often referenced in news reports on oil prices, alongside Brent Crude. WTI is lighter and sweeter than Brent and considerably lighter and sweeter than Dubai or Oman. From April through October 2012, Brent futures contracts exceeded those for WTI, the longest streak since at least 1995. Crude oil can be light or heavy. Oil was the first form of energy to be widely traded. Some commodity market speculation is directly related to the stability of certain states, e.g., Iraq, Bahrain, Iran, Venezuela and many others. Most commodities markets are not so tied to the politics of volatile regions. Oil and gasoline are traded in units of 1,000 barrels (42,000 US gallons). WTI crude oil is traded through NYMEX under trading symbol CL and through Intercontinental Exchange (ICE) under trading symbol WTI. Brent crude oil is traded in through Intercontinental Exchange under trading symbol B. Gulf Coast Gasoline is traded through NYMEX with the trading symbol of LR. Gasoline (reformulated gasoline blendstock for oxygen blending or RBOB) is traded through NYMEX via trading symbol RB. Propane is traded through NYMEX, a subsidiary of Intercontinental Exchange since early 2013, via trading symbol PN. Natural gas is traded through NYMEX in units of 10,000 mmBTU with the trading symbol of NG. Heating oil is traded through NYMEX under trading symbol HO. Purified terephthalic acid (PTA) is traded through ZCE in units of 5 tons with the trading symbol of TA. Ethanol is traded at CBOT in units of 29,000 U.S. gal under trading symbols AC (Open Auction) and ZE (Electronic). Precious metals currently traded on the commodity market include gold, platinum, palladium and silver which are sold by the troy ounce. One of the main exchanges for these precious metals is COMEX. According to the World Gold Council, investments in gold are the primary driver of industry growth. Gold prices are highly volatile, driven by large flows of speculative money. Industrial metals are sold by the metric ton through the London Metal Exchange and New York Mercantile Exchange. The London Metal Exchange trades include copper, aluminium, lead, tin, aluminium alloy, nickel, cobalt and molybdenum. In 2007, steel began trading on the London Metal Exchange. Iron ore has been the latest addition to industrial metal derivatives. Deutsche Bank first began offering iron ore swaps in 2008, other banks quickly followed. Since then the size of the market has more than doubled each year between 2008 and 2012. Agricultural commodities include grains, food and fiber as well as livestock and meat, various regulatory bodies define agricultural products. On 21 July 2010, United States Congress passed the Dodd–Frank Wall Street Reform and Consumer Protection Act with changes to the definition of agricultural commodity. The operational definition used by Dodd-Frank includes "[a]ll other commodities that are, or once were, or are derived from, living organisms, including plant, animal and aquatic life, which are generally fungible, within their respective classes, and are used primarily for human food, shelter, animal feed, or natural fiber.” Three other categories were explained and listed. In February 2013, Cornell Law School included lumber, soybeans, oilseeds, livestock (live cattle and hogs), dairy products. Agricultural commodities can include lumber (timber and forests), grains excluding stored grain (wheat, oats, barley, rye, grain sorghum, cotton, flax, forage, tame hay, native grass), vegetables (potatoes, tomatoes, sweet corn, dry beans, dry peas, freezing and canning peas), fruit (citrus such as oranges, apples, grapes) corn, tobacco, rice, peanuts, sugar beets, sugar cane, sunflowers, raisins, nursery crops, nuts, soybean complex, aquacultural fish farm species such as finfish, mollusk, crustacean, aquatic invertebrate, amphibian, reptile, or plant life cultivated in aquatic plant farms. In 1900, corn acreage was double that of wheat in the United States. But from the 1930s through the 1970s soybean acreage surpassed corn. Early in the 1970s grain and soybean prices, which had been relatively stable, "soared to levels that were unimaginable at the time." There were a number of factors affecting prices including the "surge in crude oil prices caused by the Arab Oil Embargo in October 1973 (US inflation reached 11% in 1975)." According to Citigroup analysts, the annual production of polished diamonds is about $18 billion. Like gold, diamonds are easily authenticated and durable. Diamond prices have been more stable than the metals, as the global diamond monopoly De Beers once held almost 90% (by 2013 reduced to 40%) of the new diamond market. Rubber trades on the Singapore Commodity Exchange in units of 1 kg priced in US cents. Palm oil is traded on the Malaysian Ringgit (RM), Bursa Malaysia in units of 1 kg priced in US cents. Wool is traded on the AUD in units of 1 kg. Polypropylene and Linear Low Density Polyethylene (LL) did trade on the London Metal Exchange in units of 1,000 kg priced in USD but was dropped in 2011. In the United States, the principal regulator of commodity and futures markets is the Commodity Futures Trading Commission (CFTC). The National Futures Association (NFA) was formed in 1976 and is the futures industry's self-regulatory organization. The NFA's first regulatory operations began in 1982 and fall under the Commodity Exchange Act of the Commodity Futures Trading Commission Act. Dodd–Frank was enacted in response to the 2008 financial crisis. It called for "strong measures to limit speculation in agricultural commodities" calling upon the CFTC to further limit positions and to regulate over-the-counter trades. Markets in Financial Instruments Directive (MiFID) is the cornerstone of the European Commission's Financial Services Action Plan that regulate operations of the EU financial service markets. It was reviewed in 2012 by the European Parliament (EP) and the Economic and Financial Affairs Council (ECOFIN). The European Parliament adopted a revised version of Mifid II on 26 October 2012 which include "provisions for position limits on commodity derivatives", aimed at "preventing market abuse" and supporting "orderly pricing and settlement conditions". The European Securities and Markets Authority (Esma), based in Paris and formed in 2011, is an "EU-wide financial markets watchdog". Esma sets position limits on commodity derivatives as described in Mifid II. The EP voted in favor of stronger regulation of commodity derivative markets in September 2012 to "end abusive speculation in commodity markets" that were "driving global food prices increases and price volatility". In July 2012, "food prices globally soared by 10 percent" (World Bank 2012). Senior British MEP Arlene McCarthy called for "putting a brake on excessive food speculation and speculating giants profiting from hunger" ending immoral practices that "only serve the interests of profiteers". In March 2012, EP Member Markus Ferber suggested amendments to the European Commission's proposals, intended to strengthen restrictions on high-frequency trading and commodity price manipulation. Software for managing trading systems has been available for several decades in various configurations. This includes software as a service. So-called Energy Trading Risk Management (ETRM) includes software such as Triple Point Technology, Pioneer Solutions, Sol Arc, and Open Link. One of the more popular soft commodity solutions is called Just Commodity, based in Singapore this application caters to a large number of palm oil, edible oil, sugar and wheat trading businesses. ^ This article covers physical product (food, metals, energy) markets but not the ways that services, including those of governments, nor investment, nor debt, can be seen as a commodity. Articles on reinsurance markets, stock markets, bond markets, and currency markets cover those concerns separately and in more depth. ^ In July 2009, when a high-frequency trading platform with proprietary algorithmic trading code used by Goldman Sachs to allegedly generate massive profits in the commodity market was stolen by Sergey Aleynikov there was widespread concern about the unintended economic consequences of HFT. ^ Exchange Traded Funds revolutionized the mutual funds industry when they were introduced. Exchange Traded Commodities, sold first by pioneering investors group Barclays Global Investors (BGI) (now owned by BlackRock) revolutionized the commodity market. By the end of December 2009 Barclays Global Investors (BGI) assets hit an all-time high of $1 trillion ($1,032 billion). ^ IndexIQ registered Adam S. Patti as Chief Executive Officer (CEO) and David Fogel as Chief Financial Officer and Executive Vice President in the City of Rye Brook, New York, on 31 January 2013 as representatives of IndexIQ Advisors LLC sponsoring the IQ Physical Diamond Trust. ^ "Soft Commodity Definition". Investopedia. 15 February 2009. Retrieved 6 December 2012. ^ a b c O'Harrow, Robert (21 April 2010). "A primer on financial derivatives". Washington Post. ^ a b c "Opportunities and Risk: an Educational Guide to Trading Futures and Options on Futures" (PDF). Chicago, Illinois: National Futures Association. 2006. p. 6. ^ "Understanding Derivatives: Markets and Infrastructure - Federal Reserve Bank of Chicago". Chicagofed.org. Retrieved 23 August 2018. ^ "The Regulation of Derivatives in Canada". Expert Panel. 2007. ^ Loder, Asjylyn (18 July 2010). "Commodity Manipulation May Be Easier to Prove After Overhaul". Bloomberg. ^ a b Bytom Lauricella (2 November 2009). "Gold Mutual Funds Vs. Gold ETFs: It Depends on the Goal". Wall Street Journal. Retrieved 3 October 2011. ^ a b "The Future of Commodity ETFs". Morningstar. 25 August 2009. Retrieved 3 October 2011. ^ Banerjee, Jasodhara (16 January 2013). "Origins of Growing Money". India: Forbes India Magazine. ^ Sinha, Ram Pratap; Bhuniya, Ashis (7 January 2011). "Risk Transfer Through Commodity Derivatives: A Study of Soyabean Oil". Social Science Research Network (SSRN). SSRN 1736406. ^ a b Dijkman, Jessica Elisabeth Catharina (18 June 2010). "Medieval market institutions: The organisation of commodity markets in Holland, c. 1200 – c. 1450" (PDF). pp. 1–2. ^ Stringham, Edward (2003). "The Extralegal Development of Securities Trading in Seventeenth Century Amsterdam". Quarterly Review of Economics and Finance. 43 (2): 321. SSRN 1676251. ^ "History of the CFTC: U.S. Futures Trading and Regulation Before the Creation of the CFTC". U.S. Commodity Futures Trading Commission. ^ "Variations of commodities in trading". GOptions Trading. Retrieved 29 March 2016. ^ US Commodity Futures Trading Handbook Volume 1 Strategic Information and Regulations. ISBN 1577516095. ^ Markham, Jerry W. (1987). The History of Commodity Futures Trading and Its Regulation. Praeger. p. 305. ^ "CRB® BLS Spot Indices". Encyclopedia of Commodity and Financial Prices: Grains and Oilseeds. Commodity Research Bureau (CRB). 2006. ^ O'Sullivan, Arthur; Sheffrin, Steven M. (2003). Economics: Principles in Action. Upper Saddle River, NJ: Pearson Prentice Hall. p. 288. ISBN 0-13-063085-3. ^ a b McGowan, Michael (2011). "The rise of computerized high frequency trading: use and controversy". Duke Law & Technology Review. ^ a b Johnson, David. "Stock Market Goes Decimal: Complicated fractions abandoned in favor of pennies". ^ a b Malabre, Fred; Mendelson, Don (15 December 2011). "Commodities Trading with FIX". CME Group. ^ a b Lane (Deputy Governor of the Bank of Canada), Timothy (25 September 2012). "Financing Commodities Markets presented to the CFA Society of Calgary". Calgary, Alberta. ^ Firzli, M. Nicolas; Bazi, Vincent (2011). "Infrastructure Investments in an Age of Austerity: The Pension and Sovereign Funds Perspective". Revue Analyse Financière, volume 41. Archived from the original on 17 September 2011. ^ Fontevecchia, Agustino (15 April 2013). "Violent And Panicky Gold Selling Collapse Bullion And Commodity Markets". Forbes. ^ Gorst, Isabel (17 April 2013). "Russia and less than $100 oil". Financial Times Blog. Retrieved 17 April 2013. ^ Garner, Carley. A Trader's First Book on Commodities. (New Jersey: FT Press, 2010): pg 19. ^ Futures Trading Act of 1921, Declared unconstitutional in Hill v. Wallace 259 U.S. 44 (1922), the Grain Futures Act of 1922 and Board of Trade of City of Chicago v. Olsen 262 U.S. 1 (1923). ^ William D. Coleman (2003). Governing Global Finance: Financial derivatives, liberal states, and transformative capacity (PDF). GHC Working Paper 01/2. ^ Dennis W. Carlton (1984). "Futures Markets: Their Purpose, Their History, Their Growth, Their Successes and Failures". Journal of Futures Markets. 4 (3): 237–71. doi:10.1002/fut.3990040302. ^ a b c Bienkowski, Nik. "Exchange Traded Commodities Led by Gold, ETCs Opened the World of Commodities to Investors" (PDF). Alchemist. The London Bullion Market Association (48). ^ Opalesque (14 January 2010). "Black Rock's global ETF's hit an all time high of $1tln". ^ "Benchmark Asset Management Company conceptualises Gold ETF". Etfglobalinvestor.net. Retrieved 3 October 2011. ^ "Largest ETFs: Top 25 ETFs By Market Cap". ETFdb. Retrieved 3 November 2010. ^ Michael Sackheim, Michael Schmidtberger & James Munsell, DB Commodity Index Tracking Fund: An Innovative Exchange-Traded Fund, Futures Industry (May/June 2006). ^ Koyfman, Yevgeniy (21 August 2009). "No Gas: Barclays Halts Issuance of Natural Gas ETN". Index universe.com. Retrieved 3 October 2011. ^ Jon Gregory. Counterparty credit risk. ISBN 978-0-470-68576-1. p. 7. ^ "Oil Commodities: Trading Oil as a Commodity". Commodity.com. Retrieved 28 November 2017. ^ "Web Volume Report CMEG" (PDF). ^ "Trade statistics for international business development". Trade Map. 20 September 2013. Retrieved 26 September 2013. ^ Marius Vassiliou (2009). Historical Dictionary of the Petroleum Industry. Lanham, MD: Scarecrow Press. ISBN 0-8108-5993-9. ^ Smith, Grant (26 November 2012). "Brent Poised to Depose WTI as Most-Traded Oil Futures". Bloomberg. ^ a b c Popper, Nathanial (13 April 2012). "Diamonds as a Commodity". The New York Times. ^ "The Importance of Iron Ore Derivatives - The International Resource Journal". www.internationalresourcejournal.com. Retrieved 6 September 2016. ^ See the Futures Trading Act of 1921, Declared unconstitutional in Hill v. Wallace 259 U.S. 44 (1922), the Grain Futures Act of 1922 and Board of Trade of City of Chicago v. Olsen 262 US 1 (1923). ^ "Final Rule Regarding the Definition of Agricultural Commodity" (PDF). Commodity Futures Trading Commission Office of Public Affairs. 21 July 2010. ^ "Definition of Agricultural Commodities". Law at Cornell. Cornell University. February 2013. ^ Brown, Veronica (15 April 2013). "Gold set for worst two-day loss since 1983". Reuters. ^ "Encyclopedia of Commodity and Financial Prices: Grains and Oilseeds" (PDF). Commodity Research Bureau (CRB). pp. 172–187. ^ "IQ Physical Diamond Trust". 5 February 2013. ^ "National Futures Association". National Futures Association. ^ Clapp, Jennifer (5 December 2012). "Position Limits for Agricultural Commodity Derivatives: Getting Tougher or Tough to Get?". Triple Crisis. ^ Henn, Markus (October 2012). "European Parliament decides to tackle commodity speculation: a little bit". Centre for Research on Multinational Corporations (SOMO) (14). ^ a b Maroo, Jay (13 November 2012). "Commodity position limits cause Mifid II confusion". Energy Risk. ^ Banks, Martin (27 September 2012). "EU parliament approves moves to end 'abusive' speculation in commodity markets". European Parliament. ^ Reeve, Nick (29 March 2012). "Mifid amendment calls for commission ban to be scrapped". Financial Times. Archived from the original on 21 May 2012. ^ "What is ETRM -Defined?". Pioneer Solutions. Retrieved 22 March 2019. "Opportunities and Risk: an Educational Guide to Trading Futures and Options on Futures" (PDF). Chicago, Illinois: National Futures Association. 2006. p. 48. Markham, Jerry W. (1987). The History of Commodity Futures Trading and Its Regulation. Praeger. p. 305.